This year is shaping up to be a wild one for Craft Brew Alliance. Production across its family of brands continues to decline—albeit purposefully—while attempts to adapt and innovate have increased in dramatic ways. For some time, the company has followed its self-coined "Kona Plus" strategy, which minimized focus on legacy, regional businesses like Widmer Brothers Brewing and Redhook Brewery, and placed more emphasis on the Hawaii-based Kona Brewing Company, which has grown its production levels by 15% in the last three years—at a time when many similarly-sized breweries are struggling to even sniff double-digit growth. For several years, Craft Brew Alliance (CBA) has been open about its rollback of Widmer and Redhook, which began as a natural, consumer-driven decline in the early 2010s, but became a targeted effort around 2015. Once a national powerhouse, Redhook retreated back to its hometown of Seattle, where its brewpub now acts as an innovation hub, while Widmer has been working re-entrench itself in the Pacific Northwest. 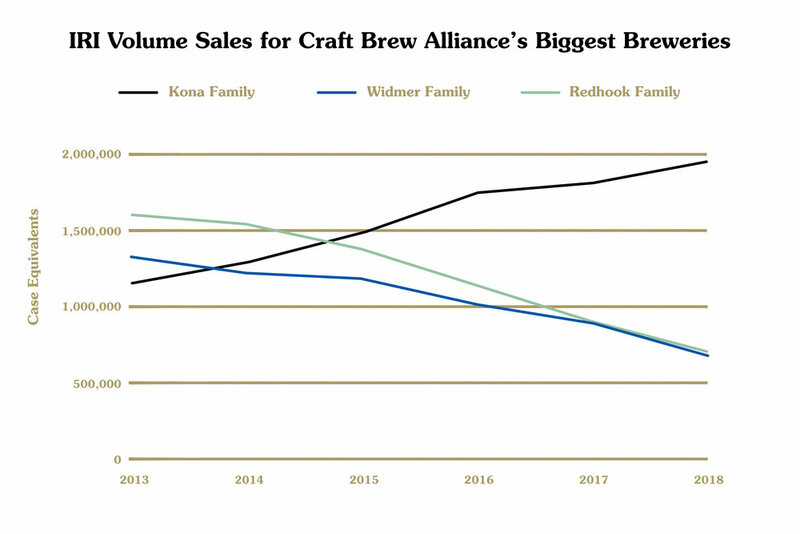 From 2016–2018, Widmer (-33%) and Redhook (-44%) nosedived in overall production, while CBA's Hawaii brand has flourished under the Kona Plus strategy, adding nearly 60,000 barrels (+15%) at a time when national-brand peers have struggled to stay flat. It's clear Kona's marketing—which includes exotic, island-themed labeling—connects with consumers. Its Big Wave Golden Ale increased its IRI sales in grocery, convenience, and other stores by 31% in 2017–2018, and last year’s launch of Kanaha Blonde Ale was a success: that release sold about the same amount in volume as Sierra Nevada Otra Vez Gose and Boulevard Tank 7 Farmhouse Ale. On the other end of the scale, Widmer's flagship Hefeweizen continues to fall after hitting an IRI sales peak in 2014. It lost almost 40% of volume sales through 2018, the equivalent of about 20,000 BBLs. The same thing happened to Redhook Long Hammer IPA, once one of the highest-selling IPAs in the country. From 2014–2018, it lost 56% of IRI sales, a little more than 30,000 BBLs worth of beer. During this same period of growth and loss, Craft Brew Alliance pulled off three deals that significantly impacted its trajectory. Starting in 2014, CBA created a "strategic partnership” with North Carolina's Appalachian Mountain Brewery, then formed a similar relationship again in 2015 with Massachusetts' Cisco Brewers. In both cases, it provided the smaller breweries with access to expertise and processes related to brewing, purchasing, distribution, and sales. In 2016, Florida's Wynwood Brewing sold a 24.5% stake to CBA. In the last three years, Cisco (105%), Appalachian Mountain (147%), and Wynwood (311%) have seen their IRI sales go through the roof, thanks to assistance in production at CBA facilities and distribution networks supported by Anheuser-Busch houses. Those continued successes prompted CBA to purchase a a full stake in its three partner brands in October 2018, a buyout of around $45 million. All three acquisitions furthered Craft Brew Alliance’s long-term goal of creating a geographically-diverse portfolio of breweries that embrace localized success as a centerpiece to growth—a hallmark of how to succeed in today’s beer industry. Appalachian has built its success on—no surprise—hop-forward beers, with its flagship, Long Leaf IPA, growing 44% in IRI sales from 2017–2018. The brewery also earned a Great American Beer Festival silver medal in 2018's American-Style India Pale Ale category for Not an IPA (P.S. it's an IPA). For its part, Cisco has a relatively balanced portfolio led by Whale's Tale Ale, an English-style Pale Ale. Its surprise #2 flagship is Pumple Drumkin, a seasonal Pumpkin Beer that more than tripled its volume sales from 2017–2018. For Wynwood, La Rubia Blonde Ale represents almost 84% of its IRI sales, and grew 80% in volume from 2017–2018. Taken together, all three breweries—and their variety of styles and locations—serve as an important collection of upstarts for CBA. As its heritage breweries like Redhook and Widmer contract to embrace their home markets, these breweries offer one way CBA is building outward from new hubs. Following in the footsteps of Boston Beer’s Alchemy & Science incubator, Craft Brew Alliance recently announced the creation of its own standalone business unit dedicated to finding and innovating new products. CBA’s “pH Experiment”—done in partnership with Yale’s Center for Customer Insights and global consultancy Prophet—will soon launch its first brand, Pre Aperitivo Spritz, after testing a variety of potential products with focus groups. According to Brewbound, some of the other ideas were decidedly on-trend, including a hard tea (Twisted Tea brands made $326 million alone in 2018), Gose with pickle juice, and a New England-style IPA made with Tang. Pre’s launch will serve as an initial metric of success for CBA’s pH Experiment, but it's what comes after that should get prognosticators excited. Per Brewbound, CBA hopes to release as many as five different products each year based on trends and feedback from customers and wholesalers. The idea is to have something new every few months, all in the hope of finding a game-changing brand. CBA has set a goal for the pH Experiment to earn $25 million in revenue by 2025, which may sound overly ambitious, but less so when considering how popular non-beer brands can be. Whether it’s a wine- or spirits-inspired drink or a newly-popular beer style, the churn of making something new can be a successful recipe. For example, Pre Aperitivo Spritz will start in just five markets based on insights gathered by CBA. Fittingly, this combined strategy of pruning (Widmer and Redhook), embracing targeted popularity (Kona), focusing on the local (Cisco, Appalachian Mountain, and Wynwood), and pushing innovation (pH Experiment) might only build on rumors about upcoming acquisitions. Even more, Craft Brew Alliance announced last week that former New Belgium CEO, COO, and CFO, Christine Perich, would become its chief financial and strategy officer. August presents a deadline for AB InBev to make an offer to buy CBA, based on a 2016 agreement in which ABI said it would pay $24.50 per share for the publicly traded company. Prices dropped from around $17-$13.50 in the past month, but the higher end of that figure wouldn’t be far off an average purchase premium in a sale. With the SABMiller deal done and barriers of acquisitions lowered by the Department of Justice, this summer would offer an opportune time for AB InBev to get back into buyouts. Given all this—and given CBA’s continued, successful investments in other breweries, as well as its new pH Experiment—its acquisition could greatly bolster AB InBev’s craft roster. ABI’s craft lineup has grown with the help of large increases in production levels and distribution, but Blue Point and Goose Island have still struggled recently in major retail outlets. And then there are those strange plans with Wicked Weed’s maybe, sorta own-premise push in Atlanta that still haven’t quite come to fruition. In a turbulent sea of increasing competition and slowing growth, CBA could be the momentum that allows AB InBev to hop on the next Big Wave.